Happy New Year! Here’s to a great 2013! It’s hard to believe 2012 has come and gone. Is it just me or do the years seem to seriously fly by once you become a parent?! If your family’s anything like ours there’s so much happening in the course of every day life that it can be challenging to find the time to pause and take a few minutes stop and reflect on how things are going. The good. The bad. And just life in general. As hard as it is to find the time, it’s always a good idea to take a moment to pause and reflect on the blessings and challenges of the past, and the hopes, dreams, and goals of the future. And the start of a new year is a perfect time to carve out a little time to do just that. I thought I’d take a few minutes to publicly reflect on our own journey this past year. Spoiler Alert: 2012 Was An Epic Year For Our Family! Have you ever had one of those years that couldn’t be described any other way but epic? Well that’s how I feel about 2012…epic! I accomplished one of the greatest goals of my entire life, watched my son achieve some incredible milestones, had a total blast being a 2nd year dad, and to cap off the year I started a new job working along side one of my life long heroes. 2012 truly was epic. Let me share a few of the highlights. 2012 started off with a huge bang due to a blog post I wrote the first week of January that ended up going viral….every since I hit the publish button on that cold January day the first week of 2012, things haven’t slowed down! I remember it like it was yesterday. I was sitting at my local Starbucks enjoying a large house coffee and trying to bang out some words to express how I felt about seeing a young model with Down syndrome in the Sunday Target ad. I finished up the post. Hit publish. Closed my laptop. Made a face as I took that last gulp of lukewarm coffee and filled my mouth full of those bitter coffee grinds at the bottom of the cup. And headed home. Turns out it ended up being a very big deal. By the time I made it home the post had already started going viral, and by the time I woke up the next morning the post was in full viral viralness. I had nothing to do with it. Sure, I wrote the words, and hit the publish button, but other than that it was all God. I don’t like to over spiritualize things, but I’m telling you, there is no way I could have made something like that happen own my own. The only bragging I can do is brag on how awesome God is that He can do something as awesome as choosing to use a simple blog post to help get the topic of Down syndrome and personhood in front of millions of people. I mean wow….just wow! I was thankful that it was used to help spark conversations all over the world about Down syndrome as the post was mentioned in numerous publications worldwide. I am blown away by the incredible community that formed around this blog, and our Facebook page, as a result of that post. We’ve met so many awesome friends as a result of people finding us by hearing about that post. Not only that, but many other people have developed friendships with other parents raising a child with Down syndrome in places all over the world! I think that’s an incredible example of how technology, and more specifically social networks, can be used to do amazing things! The Rest Of The Year (or) Roller Coaster, Whoo Hoo….. 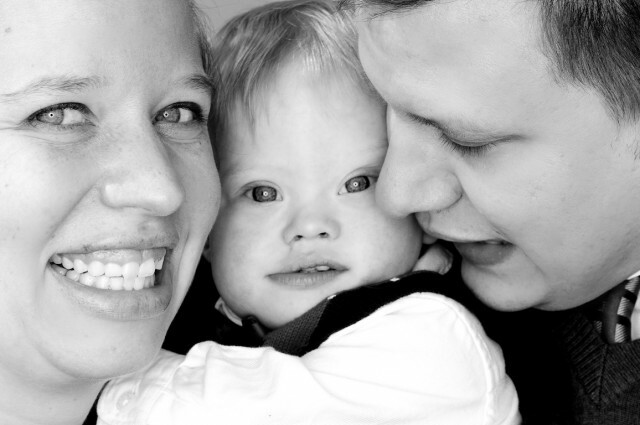 The purpose of our site is to give the world a window into the life of a family raising a child with Down syndrome by posting daily, one minute, videos. Well, up until that post we we were really on top of this…then things sort of went down hill. We got super behind on the videos, and we’re still trying to get caught up to “real time” on our videos…which we actually do plan on doing, hopefully soon! We’re going to pick some selected videos from each month to help us get caught up, so don’t be surprised if you see Noah growing up super fast in the videos we’re about to start posting. To say it was difficult would be a massive understatement. But by the grace of God I ended up finally completing my Master’s degree. You’d have to know me personally to know how big of a deal this all was, and how unlikely I, of all people, should have ever went to college…must less complete a Master’s Degree! There area no words to describe how I felt the day I walked across that stage. I’m not even sure words are needed, just a thankful heart to The One who can do things with our life we never thought we could. Oh and not only that, a few months after I finished up, I ended up going to work for (better yet, with) one of my life long heroes who also happened to be one of the main reasons I was even in grad school in the first place. In fact when I wrote this post, I had no idea I’d actually be working for him a few months later. Life (or should I say, God) is crazy (in a good way) like that sometimes. I just want to encourage any of you out there who want to do something great with you life…..just go for it! The odds may be stacked against you, but God loves bad odds. Trust me. Better yet, trust Him. We did lots of traveling this year, and it turns out Noah is a great little expeditionist! It was a ton of fun taking Noah to New York for the first time. There’s no doubt that’s my favorite city on Earth, and I look forward to lots and lots of trips to NYC with my little boy! But not only did he go to New York, he got his picture on a billboard in Times Square!!! I mean seriously, how epic is that!!! Noah also went to Key West for a little time at the beach, and we found out that Noah’s not a fan of dolphins. Like not at all. I’m not sure how many frequent flyer miles Noah racked up in 2012, but as you can see archives, he was on the move! Sadly, those moves will no longer be free. Since Noah turned 2 this year, we now have to pay for his airline tickets. Ouch! It Wasn’t All Peaches, Master’s Degrees, And Roses…. 2012 wasn’t without it’s share of challenges. I never want to give the impression that our life is perfect or immune to difficult circumstances, because it certainly isn’t. Additionally we thought Noah had Leukemia this past summer. It was if time stood still as we waited on the results of his CBC. It turned out he didn’t have cancer, but boy I sure learned a lot by thinking he did. We started off 2012 with Noah having one small “hole” in his heart that we expected to be closed by the time we visited his cardiologist toward the end of the year. I prayed almost every day the hole would be completely closed up when we in for that visit, and was very confidant that it would be. Oh, and I was reminded that you don’t always get everything you pray for. And that’s ok.
All of that to say 2012 was a super epicly awesome year. That’s just all there is to it. With the exception of a few tough days, I enjoyed every single second of it. In case you can’t tell I absolutely love being Noah’s dad. I also absolutely love being a husband to my sweet wife (who I also celebrated 5 wonderful years of marriage with this year!) There is a lot (like a lot, a lot) of joy and peace in our house. Do we have a perfect family? Nope. Far from it. But we have One who is perfect at the center of our unperfect family. I couldn’t imagine going through life without the knowledge that there was a God who was in control of all things. That everything in life wasn’t just up to chance. That we didn’t have to just live life with our fingers crossed. I couldn’t imagine thinking your child had Leukemia and clinging to a man (or a women) in white coat as your child’s only hope. I couldn’t imagine living in a world where hoped ends where science ends. There’s no hope in that. I couldn’t imagine a parent looking at their child and thinking their child came from chaos, from random happenings. There’s just to much order. To much design. To much beauty. Our children aren’t angels, but they are certainly made in the image of The One who is better than any angel…The Triune God. I couldn’t imagine seeing our little boy’s face light up with that radiant smile of his, or hear that wonderful little giggle of his, and not help but think about how amazing God is for 1.) Being so creative as to creative characteristics as wonderful as those, and 2.) For letting us experience that kind of beauty this side of heaven. I don’t how great of an artist you are, you can’t reproduce something as amazing as baby smiles, and childhood giggles in Photoshop. I couldn’t imagine reaching a major life milestone and taking all the credit for it yourself. As if you somehow, someway created your own brain. Gave it the power to think. The power to write. The power to speak. I couldn’t imagine not giving credit to the One whom credit is due for all things. We (myself included) give ourselves to much credit sometime. I couldn’t imagine waking up every day thinking that this world and all that it has to offer is the best it’s ever going to get. I rest in the fact that this world is the worst it’s ever going to be. Thank God, God Knows What He’s Doing! Ever year that goes by I’m continually reminded that there is a God, and that God really does hold the whole world in His hands….and that includes me and my family. He knows me. He knows my wife. He knows my little 2 year old boy Noah. In fact He knew our son was going to be born with Down syndrome long before we did. Noah’s extra 21st Chromosome may have come as a surprise to us, but it was no surprise to God. Humans get surprised. God doesn’t. Now this verse wouldn’t be that good if God were mean, or selfish, or rude, or hurtful, or a drunk, or cruel, or wicked. I mean lots of people do whatever they please, and they’re jerks! So as you can see, it’s a pretty awesome (and big) deal that God is in control of everything that comes our way. Including our children and all that they face. Sort of makes you breathe a bit easier, huh? I’m not sure what you believe (or don’t believe) about God, but I’ll assure you He cares about you. In fact, He loves you. More than you can ever wrap your mind around. Lots of people comment on how ‘positive’ our blog posts are, how much our family smiles in our pictures, how much joy we seem to have, etc…I just want to make one thing very clear as we go into 2013; all of that joy comes from something deeper than ourselves. All of that joy is just an overflow of the deep sense of joy and peace that we have from knowing the Triune God through Jesus Christ. He is THE reason for the season. He is THE reason for the joy. He is The One that has made our life what it is. If you aren’t a Christian this may sound cooky, or wacky, or super religious, I get that. But it’s true. Hopefully as you’ve seen us live out 2012 through this website, Facebook page, twitter account, various interviews we gave, etc, you were able to see something different in the way our family lives its life. A joy that was different. A hope that was different. And our hope is that you would ask us about that hope. We’d love nothing more than tell you all about Him. We’re only an email away. You go find your huge old Bible, or go to your local book store and buy the biggest one you kind find, open it up to page 1 and get after it. You really are going to it! This is going to be the year you finally read your Bible cover to cover. There’s the whole 7 days thing, a guy named Adam, and by the the time an apple and a snake come into play you get a little disinterested, and possibly a lot confused (“am I really supposed to believe animals talked?” you ask yourself!) and you say you’ll start again next year. It’s ok to admit. We’ve all been there. Don’t Read The Bible This Year! The Bible isn’t a regular book. It’s much different. It will change you. Tom Sawyer won’t. Let me give you something different to try in 2013. Something I think anyone can do. It’s a cool website called “Join The Journey.” If the thought of reading the entire Bible cover to cover sounds a bit overwhelming, or you’ve never been able to “stick with it”…this is for you! Basically you visit the website, enter in your email address and 5 days a week (see, I’m not even asking you to do this every day. You can do this!) you’ll get an email delivered to your inbox with some Scripture, a devotional, and a place to ask questions…for free! My wife and I are doing this as well which means we’ll be “on the journey” with you! This also means you can email us or comment on what you are reading / learning. In other words we can all be on this journey together! I think that’s sort of cool! What do you say, are you up for it? Will you Join The Journey with us in 2013? Just click here to get started! By the way you don’t have to be a Christian or “religious” to join the journey, or even live in the United States….The Journey is open to everyone, everywhere! Is It Time For A New Bible? If you haven’t picked up a Bible in a long time, or don’t even own a Bible, I think the start of a new year (and a new journey) is a great time to pick up a new Bible. If you haven’t gone “Bible shopping” in a long time you’d be surprised at how many awesome study Bibles there are these days. Study Bibles are great because they have lots of notes throughout and at the bottom of each page to help you understand what you are reading. I can’t think of a better investment for someone wanting to get serious with their Bible reading than a good study Bible. The great news is there’s study Bible for all ages. Let me give you a few of my favorites! If you’re an adult I don’t think there is any better study Bible than The ESV Study Bible . It’s my go to study Bible and one that suggest everyone pick up. I could go on and on about why I like this study Bible so much, but long story short, you will not find a better value than this one. It’s like a mini-Bible course packed up in a Bible. If you haven’t bought a Bible in a long time, or looking for a new one..that is the one! The same study Bible I mentioned above also makes a Student Study Bible which is awesome! It’s designed to help teenagers dig in and learn their Bible! I think every teenager should have one of these on their shelf. If you have a little child and don’t own The Jesus Storybook Bible you’re seriously missing out. We listed the Jesus Storybook Bible on our list of top gifts your child will like better than an iPad, and I wanted to mention it again here… because it’s seriously that awesome! If you have any questions about any of these Bibles, or decide to pick one up, be sure to let me know in the comments. I’d love to hear about it! Random fact: did you know that 2013 will be the first year not to contain a repeated digit since 1987? Now you do. You can think me later. But on a serious note, thank you to each and every one of you for being apart of our 2012. It’s really an honor to get to know you and your families. I have no idea what 2013 has in store, but I know who does…and knowing Him, it’s going to be one heck of an adventure! I’m excited! I hope this year you’ll join me on the journey, I think it will be fun (and life changing!) I look forward to learning, sharing, laughing, and loving with each of you in 2013! What do you hope to do different in 2013? Leave a comment below and tell us about it. Be sure to also let us know if you decide to join the journey and where you are from (it’s free, and easy, so I hope you do) and also if you picked up a new Bible! We want to hear all about it! Let’s make 2013 the best year of our life….so far!